Hundreds of thousands of workers marched in cities across France to protest over government plans to raise the minimum retirement age of 60, a crucial part of a reform of the costly pension system. Trade union leaders said the marches were the first step in a long struggle to defend the retirement age, which was reduced in a trademark reform of late Socialist President Francois Mitterrand. The government is struggling to bring its deficit under control, says it has no choice but to raise it. Unions have estimated turnout across France at close to a million, well above the 800,000 they said joined in similar protests on 23 March. Police have said 395,000 people had turned up and the centre-right government, which could struggle to implement its reforms if workers refuse to cooperate, sought to play down the size of the demonstrations. 'We quite clearly have had a weak turnout for the day 'government spokesman Luc Chatel told France Info radio. Bernard Thibault, head of the powerful CGT union, called the day a success and threatened more action if the government goes ahead with the reforms. 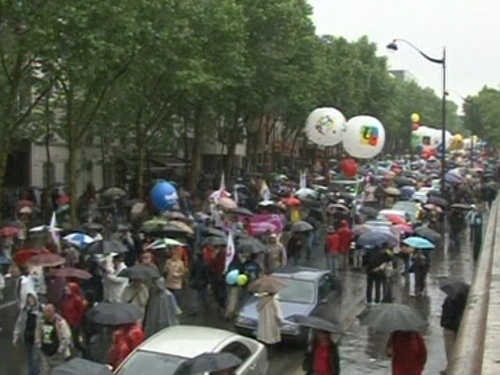 His union estimated turnout in the capital, where rain forced the marchers under umbrellas, at 90,000. Police said there were 22,000. Public services reported between 10 and 20% of staff went on strike in schools, the post office and national telecoms provider France Telecom. But transport services were working almost normally, with only a few flights and trains hit by staff walkouts. Labour Minister Eric Woerth has said he saw no convincing alternative to raising the retirement age, and Budget Minister Francois Baroin said a pension reform bill would be debated in parliament after the summer break. Sarkozy added a partisan sting to the debate on Wednesday by saying, to loud protests from the opposition Socialists, that France would have 'much fewer problems' if Mitterrand had not dropped the retirement age from 65 to 60 in 1983. Socialist Party leader Martine Aubry joined the protesters in Lille, where she is mayor. Large marches were also reported from Marseille, Rouen, Bordeaux, Rennes and other cities, all with higher turnouts than in March. According to a report last month France's pension system faces a funding gap of around €70bn in 2030 and that could rise to more than €100bn by 2050. French media say Paris is considering upping the retirement age to 62 or 63 years and extending the period during which contributions have to be paid to 42 years from 40.5 years by 2030. President Sarkozy has singled out an overhaul of the pension system as his government's key reform project this year but his plans have already aroused strong opposition from unions. The transport chaos partly because the reform plan would not touch costly special pension schemes for transport workers, a powerful sector that brought an earlier conservative government to its knees in 1995 when it tried to reform them. Labour Minister Woerth said the turnout indicated that more French people were beginning to understand the government's pension reform plans.